Scotland gave their best performance in several years to beat the world's fourth best team on their own turf. It was a display full of self-belief, guts and quality from Gordon Strachan's men to record their first win of the World Cup qualifying campaign. Robert Snodgrass scored the crucial goal, latching onto a loose ball to prod it past Stipe Pletikosa. Croatia pressed for an equaliser, but failed to bring out a save of any note from Allan McGregor. 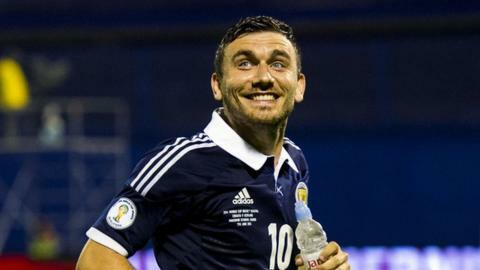 The contrast between this Scots performance and those that have preceded it was remarkable, with Russell Martin, James McArthur and Alan Hutton perhaps the pick of a heroic bunch. Of course, it comes much too late to make any impact in the group, but it ensures Scotland will be in pot four for the draw for Euro 2016 and gives the Scotland management team something concrete to build on for the future. They set the tone in the opening stages with some confident passing and dogged closing-down to ensure the Croatians were unable to seriously threaten McGregor's goal. The same could be said of Pletikosa - the home keeper barely touching the ball before his side found themselves a goal down after 26 minutes. The goal had a touch of fortune about it, but Scotland will feel they were rewarded for their endeavour, as Shaun Maloney's attempted pass broke off a Croatian leg and the ball fell kindly for Snodgrass, who stretched to nudge it past Pletikosa. The keeper took an accidental boot in the face as Snodgrass beat him to the ball and required lengthy treatment before continuing, but he was rattled, much like the rest of his team-mates. That good Scots work was almost undone, though, when Grant Hanley was short with a pass-back, forcing McGregor to take evasive action to deny Mario Mandzukic and when the ball broke to Sammir, Hanley breathed a sigh of relief as he lifted the ball over the bar. There was further concern for the visitors as Ivica Olic sold Alan Hutton a beautiful dummy, but Russell Martin dived in and forced Olic to shoot wide and moments later the Norwich defender performed further heroics to keep a Darijo Srna shot from crossing the line. Olic and Barry Bannan both blazed fierce shots just off target at the outset of the second half, but Croatia missed a fantastic opportunity to level the match after an hour's play. Olic fired in a terrific cross from the left, which was begging to be tapped over the line, but Mandzukic arrived a fraction of a second too late to get the crucial touch. Croatia continued to see more of the ball, but Scotland's work ethic was phenomenal, closing down their opponents while retaining their shape and making it extremely difficult for the home side to create clear-cut chances. Indeed, McGregor didn't have to dirty his gloves for the remainder of the match as the Scots held on for their most momentous win since the 2007 victory over France in the Parc des Princes.